We’re excited that Elizabeth Porcher Jones is coming to our Triangle Calligraphers’ Guild meeting on September 13, 2014, to kick off our new meeting year of 2014-2015. 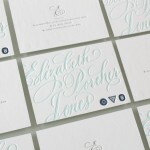 She will share her experiences serving Charleston as one of their premiere Wedding Calligraphers. In our guild meeting, she will be giving a presentation about some of the weddings she has worked in Charleston, sharing the ins and outs of weird materials used, what she does onsite at events, etc. This will be from 10am-1pm. After the meeting, from 2pm-5pm, Elizabeth is offering a workshop loosely titled “Wedding Calligraphy: Finding Your Own Style.” Those of you who have done wedding envelopes for family and friends probably have a lot of questions you’d like to ask Elizabeth! Now’s your chance. “How do I line envelopes?” “What inks are good?” “What do I charge?” etc. If you are thinking about doing wedding calligraphy as a business, or even just for fun, we have this wonderful opportunity to learn from someone who has worked at it for years and is very successful. I encourage you to take this fabulous opportunity to learn from her. The supplies you will need for this workshop are minimal – a bag lunch (to make sure you eat after the regular meeting), your favorite pointed pen, ink (she loves McCaffery’s Indigo Blue and Ziller acrylics), an empty dinky dip with a dropper (to try her inks), white soapstone pencil (probably found at sewing stores), and a 1′ T-square. No slant boards needed. The fee for this 3-hr workshop is $30.